During a Gluten-Free Living Facebook Live event on March 29, the GFL team gave their first impressions of hot new foods in the gluten-free world. These products, from gelatin shots to birthday cake bites to probiotic gummies, are innovative and exciting products to stock up on for spring events. Watch the video to hear their thoughts and check out the list of products mentioned and where to find them. 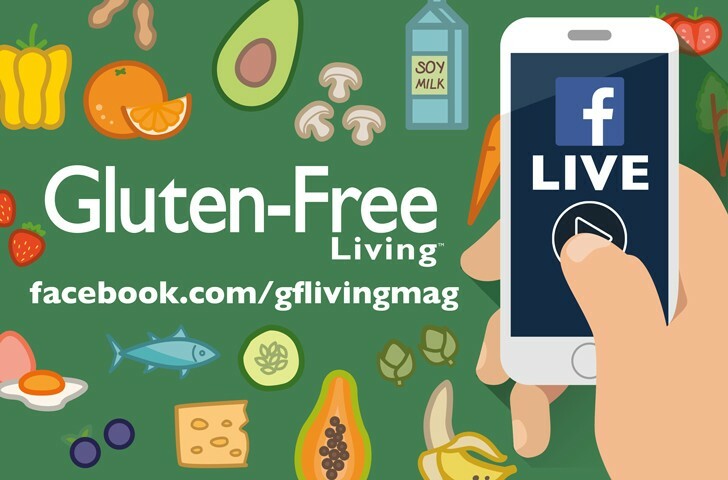 If you would like to send gluten-free products to Gluten-Free Living for consideration in a future Facebook Live event, email the editor at [email protected] for the shipping address. Stay tuned on Gluten-Free Living social media for more live product tasting events. Click here for our roundup of gluten-free foods from the last Facebook Live the team did. Hope & Sesame makes sesamemilk from organic sesame seeds, creating a nutritious beverage that can be enjoyed on its own or with cereal, smoothies, protein drinks or any time you need a splash of non-dairy refreshment. If you’re training for a marathon this spring or just trying to be more carb-conscious, this milk is made with low FodMap ingredients, is Keto friendly, USDA organic, vegan, kosher and GMO free. The sesamemilk comes in original, vanilla, unsweetened, chocolate and chocolate hazelnut flavors, so you can choose whether you prefer an indulgent treat or a smoothie base. Buy them here. Rule Breaker Bites are vegan, nut-free and have no GMOs, but they’re soft, sweet and feel like you’re eating something naughty. The Birthday Cake Bites are full of white chocolate chips and rainbow sprinkles. They satisfy your sweet tooth with less sugar, no animal products and no preservatives. The first ingredient is chickpeas and the snack is vegan. Back the Kickstarter campaign here. Schmidt’s Natural Deodorant comes in fresh scents ideal for springtime. Our testers tried out the Coconut Pineapple variety, which is tropical and fruity. Interested in learning more about gluten-free personal care products? Read about it here. This line of deodorant is certified vegan and cruelty free, use botanicals and mineral-derived ingredients that have healthy benefits and are free of aluminum, parabens and artificial fragrance. Buy them here. The jalapeno pork cracklings taste testers sampled were declared a delicious treat. You can find them on shelves in June 2019! A crackling is a fried pork skin taken from the shoulder of a hog and small pieces of meat that adhere to the skin. EPIC Pork Cracklings are an innovative take on an iconic American snack food. Buy them here. Each taste tester got to try their own health shot. The Live More Naturals drink contains daily vitamins, 21 superfruits and energy from matcha green tea. The berry flavor made the drink, which is packed with antioxidants, go down easy and delivers lasting energy. Buy them here. The Vive Organic immunity boost wellness shot is a proactive defense combo with ginger root, turmeric root, cayenne pepper and black pepper. The blend of roots, fruits and flowers works together to strengthen the immune system whether your immunity is weakened from travel, stress or changes in the weather. Buy them here. Finally, the Vital Proteins Zen Collagen Shot delivers a quick serving of 7 grams of collagen for skin, hair and nail support and a youthful appearance. The shot is infused with notes of chamomile and citrus and contains magnesium and L-Theanine for a portion of relaxation. Buy them here. We sampled the Country Archer original beef stick and jalapeno beef stick, plus a rosemary turkey stick. The beef sticks are made with 100 percent grass-fed beef and have no nitrates, MSG, hormones or antibiotics. They are high in protein, with 9 grams and 0 grams of sugar. The beef sticks contain 100 calories and the turkey has 70. If you’re camping, hiking or traveling this spring, these sticks are an excellent way to stay energized. Buy them here. These gluten-free, dairy-free gummies promote digestive, colon and immune health and supports digestion of lactose in dairy products. The probiotics are shelf-stable and have prebiotic support that nurtures probiotic growth. Probiotics are “good bacteria” that naturally live in the digestive tract, and probiotic replenishment is important for digestive balance and overall wellness. These gummies are made with natural colors and flavors and contain no preservatives or artificial sweeteners. Buy them here. These crunchy cookies are naturally gluten-free and made with simple whole food ingredients. They’re sweetened with coconut sugar and also contain almond flour, coconut flour, tigernuts (a probiotic root vegetable) and coconut oil. They are free of grains, soy, corn, dairy and gums and are non-GMO and paleo friendly. Buy them here. This gluten-free and vegan biscotti is crunchy and dry, ideal for dunking in coffee or tea. The dark chocolate creates a rich, slightly sweet flavor. The biscotti is free from egg, soy, wheat, corn, dairy, animal products and sugar. This treat would make a delicate addition to a spring tea spread. Buy them here. These shots, made with premium vodka, come in easy to squeeze packaging with no mess and no preparation needed. They come in a variety of colors and flavors and are kosher, all-natural and gluten free. This spring, Shottys would be an excellent choice to bring to tailgates, barbecues and other celebrations to have some party fun. The cups are recyclable and BPA-free, and the company tries to minimize packaging and waste. Buy them here. Tune in for our next Facebook Live taste test on April 12 at 3 p.m. EST!